Ok, so, I like I'm so out of my element. I don't think I've ever done "vintage". It's just not my style. Well, this week at 365 Cards, the style is vintage. So, I guess, this is a real challenge for me. Today, as the title says, it's vintage + stickpin. 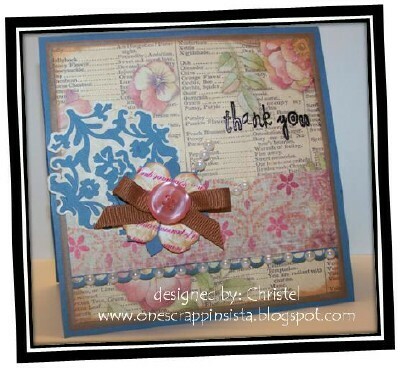 I created a 5 x 5 card for the challenge using the sketch from The Paper Players that I saw on Janice's blog for this card. (I needed inspiration bad ya'll.) Well, my first challenge was, I didn't have any stickpins so what's a girl to do? If you know ANYTHING about me, I'm frugal. I kept looking around until I found some jumbo paperclips. I stretched one out, and cut two pieces of it using my wire cutters. Yeah!!! First part down. Then, I took some adhesive pearls and adhered them to the wire. I thought there would be problems, but it worked perfectly. 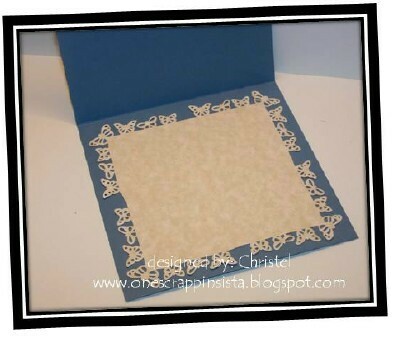 The based and layer are cut from Recollections cardstock. The rose patterned paper was a RAK from a former co-worker. I have no idea where the paper came from. The other patterned paper is by 29th Street Market. It's called Pleasant Petals. I cut the scalloped border using a MS punch. I added pearls and distressed the edges with tea dye Distress ink. The emblems are from the Home Accents cartridge. I didn't have lace or any other ornate item so I used the Cricut to make what I needed. I finished the card off with a flower which was stained with ink, ribbon, and a bow. I hope you enjoy my stretch of the vintage style. Enjoy! Oh......I almost forgot to mention, on the inside is my first real shot at using the MS punch around the page punch. The paper didn't link up exactly but I guess it turned out ok.
Beautiful vintage card! Great job with The Paper Players sketch! You are super creative! I love it! I think maybe you need to do more vintage...you rocked the challenge!!! Great job with the inside and outside! Such a fabulous take on the Paper Players sketch. Love the vintage feel and the soft color combo. So glad you joined the players this week.